Trifle - To Die For!!! This Strawberry Shortcake Trifle is the recipe to die for provided you are a dessert lover! As Currie states in his note to us, "A delicious, simple and attractively festive dessert." "The presentation is deceptively easy!" We have to agree. We were blown away at how easy he prepared this dessert just before we ate it all - oohing and aahhing as we finished the dessert with the look of despair.... It's gone! The Strawberry Shortcake Trifle picture here does not do it justice, and I am sure if one assembled it in a small dessert glass it would look spectacular. So, give it your best effort, which by the way should not be very difficult because with a little imagination you will be the Strawberry Shortcake Trifle Expert in your family! For us, this is a 3-Fork Rating out of 3 Forks! Thanks for submitting your delicious recipe to us, Currie it not only tasted great, it went down....oh so easy. Your favorite strawberry shortcake biscuits. Currie uses Bisquick shortcakes, and make a full batch. Use six biscuits, about 5 inches in diameter by 2 inches high in the middle. That’s about how much you’ll need. You can also use store-bought or homemade pound cake, but it’s not Currie's preference. First, bake (or buy, if you must) your biscuits and let them cool. Note: This should be done well in advance, because this is a cold dessert, and warm shortcake isn’t part of the appeal. At the same time, prepare most of the 3 lbs of your strawberries (keep maybe 10 strawberries aside for garnish) by slicing their tops off and halving them, then putting them in a large bowl mixed with the ½-cup of sugar. Let them sit for a few hours at room temperature or overnight in the refrigerator; they should end up sitting in plenty of their own juice. The final preparation is quick, takes 15-20 minutes, and occurs right before serving. Start by beating the whipping cream in an electric mixer until it becomes fluffy. Once the cream is whipped, fold in with a baking spatula the ¾ cup of fully melted, but not heated, vanilla ice cream. Next, into your trifle bowl (or some other kind of bowl, if you don’t have a trifle bowl at your disposal), crumble half of your biscuits to create an even layer on the bottom. Spoon about half of your sweetened strawberries onto that layer, and include a couple spoonfuls of juice so that it seeps into the shortcake. The next layer gets half of your whipped cream. On top of the whipped cream, crumble the rest of your biscuits, then strawberries and a little juice, then the remainder whipped cream. Use the few strawberries that you did not sweeten to garnish the top, and serve immediately. Optional, as pictured: If you feel like giving this treat another dimension, sweeten about 1 lb of fresh blueberries with about ¼ cup of sugar at the same time as the strawberries. Add the blueberries right on top of the strawberries when you layer the trifle. 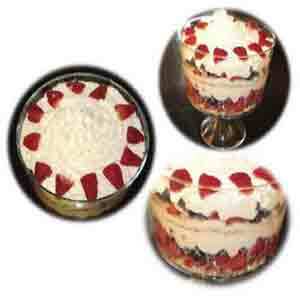 Serve your Strawberry Shortcake Trifle chilled if prepared well in advance. Best served immediately after preparation. Note: This recipe serves 12 to 14 Adults. If you like this shortcake, you can find a more traditional and fantastic recipe from StrawberryLovers. Return from Strawberry Shortcake Trifle To Easy-Everyday-Cooking-Recipes.